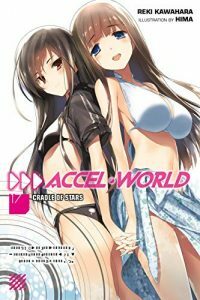 For the most part this is a “downtime” volume of Accel World, a breather after the action of the last few books. We get Niko and Kuroyukihime coming over to Haruyuki’s house for a sleepover, where he suddenly goes into great detail about his family, presumably in order to make a future arc not come out of nowhere. He and Takumu are also confronted by a classmate who wants them to join her in running for the student council, something that really hammers on Haru’s “I hate myself” buttons. There is, of course, a pool episode, with swimsuits galore and Haruyuki accidentally seeing more than he should. Nega Nebulus adds to its ranks with the Chocolat Puppeter trio (complete with an explanation of why her name is written wrong in English). And we get a big confrontation with the Green team, as they discuss how to defeat the Acceleration Research Society. The cliffhanger shows that one of Green’s group is very familiar to Nega Nebulus. Who could it be? …and then it promptly shows us who it is in a short story set after the main book, where we see a younger Kuroyukihime getting ready to level up to Level Nine with the help of her teacher and companion in Nega Nebulus. It does sort of undercut the cliffhanger considerably. I’m also not sure I like our teasing creator suggesting something that clearly isn’t going to be true. Kawahara is already well aware that fandom thought Kirito and Asuna were Kuroyukihime’s parents, and went out of his way to shoot that down. But here we see a mysterious black figure, with two swords as his main feature, who pretty much describes himself as a sword, and who occasionally shows signs that he’s not in elementary school like the rest of them (such as his knowledge of what a pencil is). It screams “COULD THIS BE KIRITO? !” so much that it clearly isn’t, but I’m not sure I appreciate the author trolling in quite this way. We see Nega Nebulus expand a great deal in this book, as I said earlier. In addition to Chocolat Puppeter’s group challenging Haruyuki so that they can ask to join their group (which leads to the funniest fight in the book, as even Silver Crow shows he is not above eating his way out of a problem), Metatron’s “bug” form is introduced to Kuroyukihime and Fuko, and there’s a brief amusing confrontation as to who gets to be his master/teacher. Haruyuki’s life in the Accel World is expanding, with friends and loved ones. He’s still having trouble transitioning that into the real world, though, despite the basketball game a few volumes ago (which is brought up here) and despite everyone literally pointing out all the great things he’s been doing. Once you start regarding yourself as pathetic, it’s really hard to stop it, and I appreciate that we’re seeing this with Haruyuki, even if it can be frustrating. So, since the cliffhanger was sort of given away after the fact, the real question for next volume is why is their old friend now working for the enemy? Also, wasn’t he trapped in the palace the way that the others were? And will Haruyuki run for office? Or finally choose a level-up bonus? Still a good series, despite my criticisms. Oh yes, and don’t spend 15 pages building up why the next world will be a Space world and then have it NOT be a Space world. What was the point?